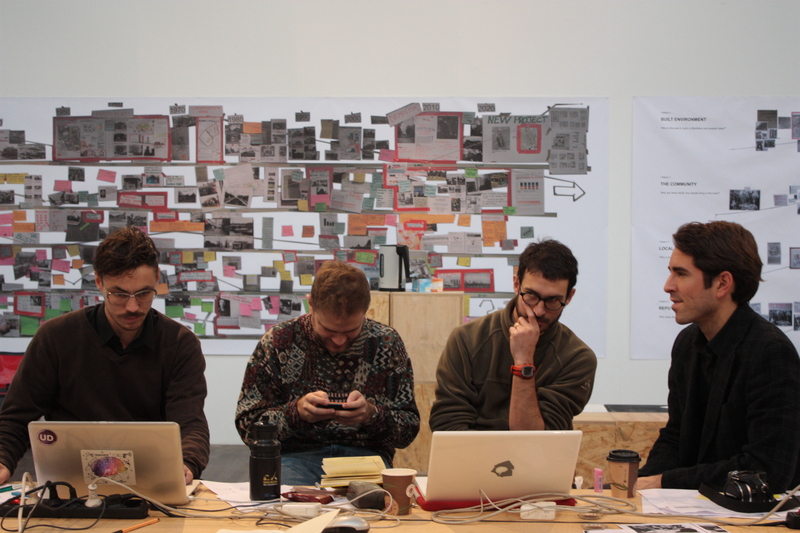 In co-operation with the Deutsches Architektur Zentrum, FA conducted a 5-day workshop on Berlin’s Neues Kreuzberger Zentrum. 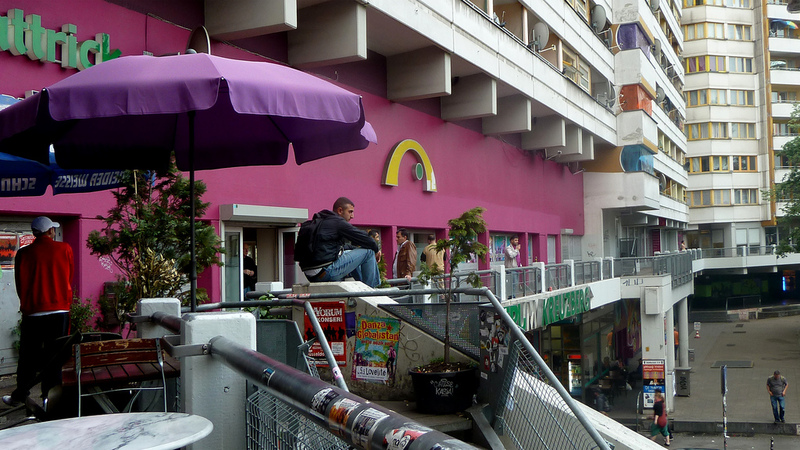 Berlin’s Kottbusser Tor area has experienced its fair share of urban renewal strategies over the past few decades. Nowhere else in Germany are the different phases, ideas and paradigm changes in urban planning more discernable than at this chaotic traffic junction in the heart of Kreuzberg. Together with our local host, the Deutsches Architektur Zentrum (DAZ), we decided to dive into the case of the much discussed and often derided Neues Kreuzberger Zentrum (NKZ), a mixed-use redevelopment project dating from the early-1970s. The group of 25 participants with whom we cooperated during the five-day workshop turned out to be a sharp and creative bunch. Subdivided into five groups they scrutinized the NKZ’s path-dependency, all focusing on one aspect of NKZ’s development – the built environment, local community, economy, reputation, and politics – from 1945 onwards. We invited several experts and locally involved people to both contextualize the case and provide us with specific information. On the first day, Kreuzberg Museum’s director Martin Duspöhl invited us to the museum and gave a one-hour talk about Kreuzberg’s tumultuous post-war history. 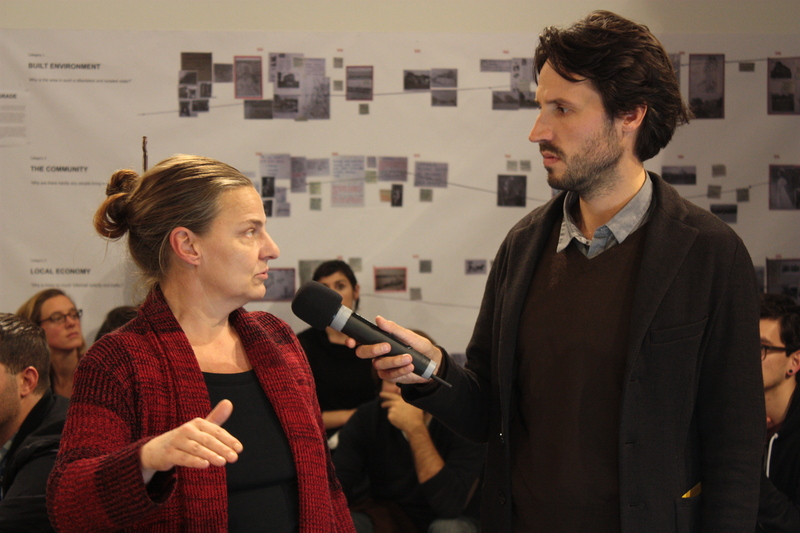 His talk was supplemented by a tour by Monika Müller, showing us the physical remnants of this history, including the so-called Kreuzberger Mischung, urban renewal and regeneration efforts, collectivized properties, and the social implications of the more recent gentrification. 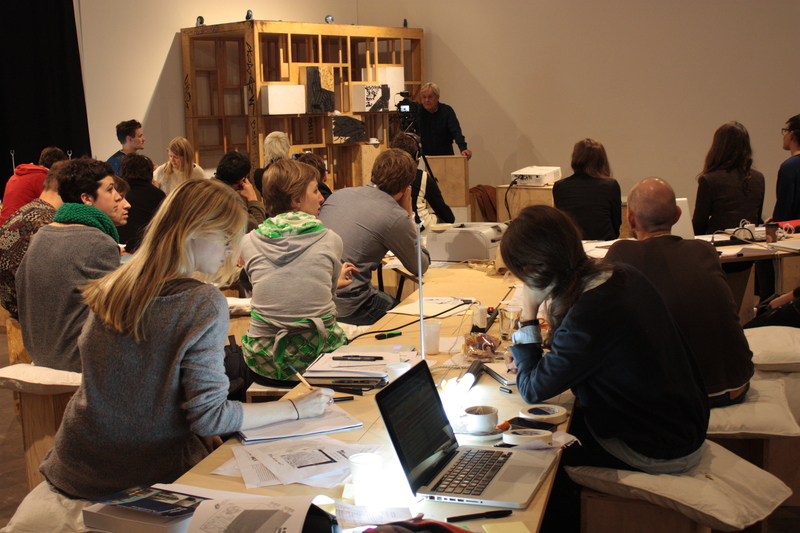 The starter of the second day was Axel Timm, member of the renowned raumlaborcollective, which is known for their architectural and spatial interventions. Timm talked about their Dolmus initiative – a local transport system that temporarily transformed privately-owned vehicles into means of mass transport, by which raumlabor brought local residents together in an informal way. Furthermore, Timm demonstrated how the Kottbusser Tor has become more fashionable over time by showing a video of the highly popular German band Seeed, which was shot in the area. We invited Carsten Krohn, known for his ‘Das Ungebaute Berlin’ (The Unbuilt Berlin) project, to contextualize the NKZ by explaining the visionary ideas and ideals that dominated post-war planning and politics in Berlin. Krohn surprised us by bringing along a very special guest: Johannes Uhl, the architect who designed the NKZ in the early-1970s. Uhl, now 78, provided us with first-hand information about the ideas behind his design. He was disappointed by the lack of political support and his consequent inability to carry out the larger urban renewal scheme, of which the NKZ was only one element. Furthermore, several envisioned amenities such as a kindergarten were never built, much to the regret of mister Uhl. This lack of central amenities eventually became the main focus of critique. When asked what he would like to change about the building to make it better today, Uhl explained he would like to see some adjacent tenement houses get torn down in order to make the overall design look more like the initial 1970s plan. The architect clearly never lost his visionary approach, although he had to admit his visions were unfeasible in our times. On the third day architects and lecturers Christian Dengler and Andrea Benze looked at the many ways in which the NKZ has been perceived over the past few decades. Initially, the design was met with great enthusiasm by virtually each and everyone in West Berlin, but when in 1974 the first tenants and shop owners moved, the complex was already much derided. As Johannes Uhl had already pointed out, this was mainly due to the decision to not realize all the initially planned communal spaces and amenities. When a younger generation started to re-evaluate Kreuzberg’s nineteenth-century tenement houses in the 1970s, the NKZ came to be seen as a symbol of everything that was wrong with large-scale urban renewal. The building changed from an utopian beacon into a dystopian nightmare. However, over the last two decades tenants have pragmatically adopted the building’s design for their own purposes. Also, new shops and bars have opened up in spaces that had been running into dereliction for almost than two decades. According to Dengler and Benze, this demonstrates how a large utopian vision can turn into several smaller, more individual expressions of utopianism. Peter Ackermann, who has been involved in the NKZ’s management from 1976 to present, provided the closing keynote on the third day, giving an insight into the building’s financial situation throughout time. In the period when he was administrator and manager, from 1998 to 2005, the building’s financial situation had to change from a bankrupt operation, supported by large influxes of public money, into a commercial operation without public subsidies. While being of no use to the original investors able to pay off its debt. The experts’ input was rounded up by a wonderful tour organized by the NKZ’s building engineer Alina Vynogradova and rent manager Andrea Schindler, the latter being responsible for the letting of the 300 apartments and 80 commercial units. They provided us with valuable insights into the structural and technical state of the building and its recent and less recent social dynamics. These talks, accompanied by the archival research and interviews conducted by our research team of 25 strong, were the input for our research result: a 7 meters-long time line at the Deutsches Architektur Zentrum, on which all five sub-groups presented their findings describing the ups and downs of the Neues Kreuzberger Zentrum over its almost forty years of existence. Below is a short summary of the findings. A digital version of the complete time line will be on our website soon. The NKZ has been a popular subject of discussion and media coverage, mostly in a negative sense. 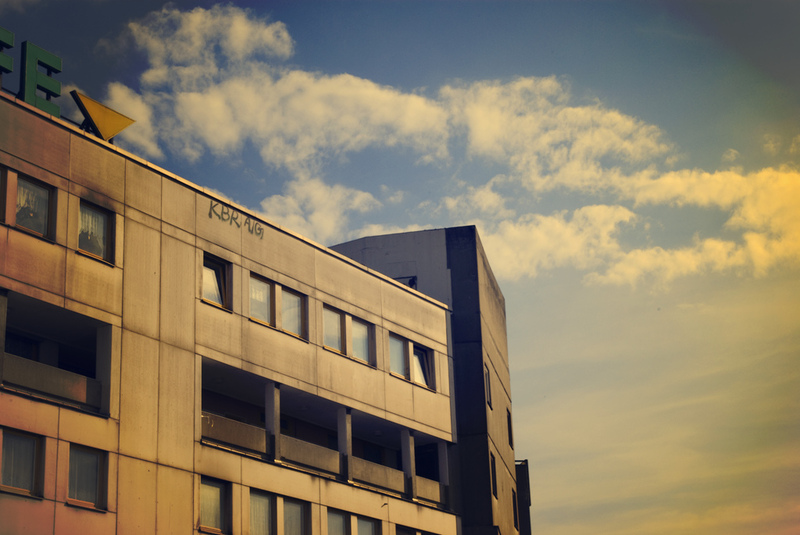 The building, constructed between 1969 and 1974 as a public-private venture, was part of a larger urban renewal scheme for which a large share of Kreuzberg’s housing stock had to be demolished. Moreover, the area just northwest of the NKZ was designated to become an important highway junction. This highway was never built, neither was the lion share of the modernist redevelopment scheme for the area, leaving the NKZ as a somewhat alien structure in the middle of an area characterized by nineteenth-century tenement houses, the once much-derided Mietskaserne. The NKZ eventually became home to a large community of migrants, mostly Turks. As a result of two important metro lines – U1 and U8 – crossing at Kottbusser Tor, the area became known as a drugs and homelessness hot spot after Berlin was reunified in 1989, It is argued that the morphology of the NKZ contributed to this, providing uncanny public spaces suited to informal activities. The commercial spaces in the lower levels of the building were either not rented or occupied by highly homogeneous economic activities. Several politicians called for the demolition of the NKZ in 1998, with CDU-heavyweight Landowsky being the most prominent one. However, the NKZ’s low point seems to be more than a decade behind us now, simply because the place seems to work perfectly well for its residents, which is articulated in the liveliness that you will find in the public space around it, the diversity and economic activity of the shops and the changing public opinion on the NKZ. The building’s rough spatial edges contribute to the allure of the place to a certain – mostly young – crowd. This might pose future problems. More affluent people and shop owners moving into the NKZ will certainly create more spatial and social pressures. While the NKZ’s reputation has definitely changed for the better, our research efforts did show one significant failure: the financial and ownership model it was built on. This has resulted in the current precarious financial and physical state of the building. In the 1960s, it was vital to the West Berlin Senate and the West German government that the city kept attracting investment and inhabitants. One of the instruments used was a huge tax incentive for people investing in West Berlin (investments were 200 % tax deductible), besides the 7 % of interest paid on their investments (e.g. when you invested 100.000 DM, you were given back 120.000 DM through taxes). The NKZ quickly proved to be not economically viable: rental income did not cover the management and maintenance expenses. Those who invested quickly found out that they would not receive any dividend. The debt was about three times as high as the building’s ‘net present value’ (if all goes well, it will be paid off by 2067). In 1980 the building’s management was unable to pay quarterly payments to the investment bank. Any normal company would have gone through bankruptcy, but if word had gone out that the NKZ had gone bankrupt just 7 years after its completion, this would have meant a huge blow for West Berlin’s financial climate. For this reason a new investment scheme was created, with new investors and more government money in order to keep the NKZ viable. The financial situation however did not improve substantially.. The West Berlin Senate had to keep investing in the building since the rental incomes only covered 60 % of the costs. These subsidies would contractually run out in 2004. With these prospects Ackermann became facility manager back in 1998. Most people – including politicians – told him to let the NKZ go bankrupt and hand it over the management, but he refused to do so. By adopting a more active stance towards the NKZ’s shop owners and renters and by improving the building’s design, Ackermann was able to make the building solvent by the time subsidies ended in 2004. Nowadays, the NKZ (renamed to ‘Zentrum Kreuzberg’ by Ackermann, generates enough income to pay off its debts and keep the building’s facilities running. However, incomes will most likely not cover potential major technical failures. It is highly uncertain whether the building will still be there in a reasonable shape by the time its debts are paid off, around the year 2067. An interesting conclusion is that the building was neither built out of a housing necessity, nor did it have a sound commercial foundation – it was a purely political act, which was an important cause for its quick downfall. Its recent recovery, however, is praiseworthy. But then again, if the NKZ was located in a more peripheral location (as with our preceding case study in Nottingham), the building might have already been slated for demolition. On the fifth and final day we rounded up the week with a public presentation and debate at the DAZ, during which all visiting experts were present once again. Some 70 people attended the event, including several of the NKZ’s tenants. The general conclusion was that the NKZ is not a failure in itself, be it that it had a difficult start that still influences the unstable success of the building today. Underneath you will find a video registration of the workshop by Daryl Mulvihill. A compilation of recent and less recent video clips featuring the NKZ and Kottbusser Tor can be found here.